When Ember Colton wakes up in a strange house without any memory of how she got there, she witnesses a murder, and must run for her life. With her photographic mind, she uses her psychic ability to draw, while in a trance and creates a silver ring with an unusual design on the hand of the killer, the only part of him she saw. Phoenix McCoy's sign, fire, is his symbol in Ojibwa, his First Nations background. When he meets Ember, the sparks fly, and he can’t help but stir the passion between them. Walking on coals to keep her safe, and at arm’s length, he falls for her hard. Running from the pain of love’s betrayal, he swears he won’t get involved, but in order to keep her alive he has to keep her so close that the fire between them burns hotter, until he can’t protect his heart anymore. Together they run from love and danger, only to become entangled in both, and two flames become one. Nodding as speech eluded her, Ember stared over at the vehicle for a moment then walked back to it. She picked up a rope from the bag, and took it to him, handing it over silently. Smiling, Phoenix took the rope from her. "Good thinking," he said, hiding his grin when she blushed and stared down at the tree. Tying the rope around the top branches of the tree, Phoenix walked a few feet away, and nodded. Ember ran over to him and grabbed hold of the rope a few inches above his hands. "Ready? When I say pull, we give her all we’ve got. One, two, three, pull!" When both of them tugged hard on the rope, the tree moved faster than they expected, flying toward them. Ember lost her balance. She shrieked as she went flying backwards, slamming into Phoenix, and taking him to the soft ground. Throwing his arms around her, he did his best to cushion her body with his own as they fell. Twisting, she landed on top of Phoenix. He grunted at the force of the drop. "Oh, my God, are you all right?" she cried, laughing until she noticed he lay still as though in pain. Unable to tell her that his pain wasn’t from the fall, but from her curvy body lying on top of his, he kept his eyes closed for a few moments, and tried to take in some deep breaths. His arms were clenched around her to keep her squirming body immobile. When finally, he could talk a little, he said, "Just…hold still…for a minute. I need a minute." Shuddering, he focused on his breathing. Ember seemed worried about him, and moved her head closer, running her hand over his cheek. "What can I do to help you, Phoenix?" she said softly, her voice husky with concern. When he suddenly rolled them over so that she was on the bottom, she gasped. Surprised when he realized that she'd lost her fear of him, he cupped her cheek, sliding his arms around her small waist. She released a sigh as she threaded her fingers slowly through his silky black locks. 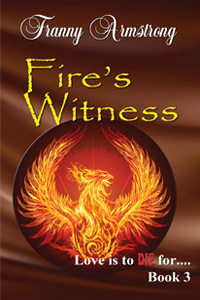 Seeing the invitation in her eyes, Phoenix gently lowered his lips, and brushed them over hers. Though Ember froze in place, holding her breath, she began to relax under his hot, wet lips. Hesitant, she began to respond, her lips softening and blending into his. His heart raced as she melted beneath him. Slowly she ran her shaking fingers over his hard muscled back then up into his hair again. He shuddered with need as she closed her eyes in bliss, and pulled his head closer, her breasts burning against his chest. Gently breaking the achingly sweet kiss, he lifted his head and stared down into her glazed eyes, watching her parted, moist lips. She was beautiful and innocent, pure of heart. His breathing quickened as a wave of searing desire crashed through his loins. Although nature serenaded them with its melodious symphony, neither of them noticed. Their souls met, their gazes locked, and they froze, afraid to break the fragile moment. Her hands anchored in his hair. She slowly pulled his head down to capture his lips again, kissing him with abandon. She moaned into his mouth making him want her all the more. When he captured her moan in his mouth, he suddenly realized what he was doing and pulled back. Horror washed over him as he shook with reaction. "Oh, God! I’m sorry, Ember. I can’t believe I did it again, I—." Scrambling off her, Phoenix ran his fingers through his hair, and started to pace in agitation. "What was I thinking? Brett’s going to kill me!" Holding out his hand to help her up, unable to look at her, he waited for her to take it.